One’s 20, one’s 18 and one’s only 15, they’re all presumably allowed to stay out ’til way after bedtime and yes, they’re all brothers – and their last name? Robertson. No, we’re kidding – it’s Jonas. So however they came up with their name is a complete mystery to us. 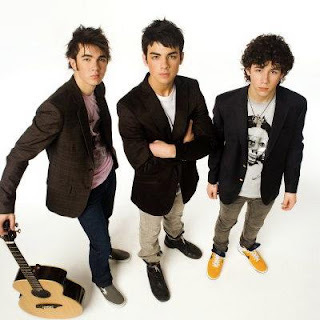 Please, meanwhile, have mercy on our souls for putting posts of two ‘tween’ acts back to back on •auspOp•, but the Jonas Brothers have JUST pOpped their brand new clip ‘Burning Up’ online and it’s the first single from their brand new LP. An album a year since 2006 and these kids are taking the Disney-lovin’ pre-pubescent record-buying girly-girl pOppers by storm. Their first album (2006) hit the dizzying heights of 91 on the US charts. Their second just one year later? No.5. And if that’s any indication, expect their new album ‘A Little Bit Longer’, due in August, to do similar numbers. * This is •auspOp•’s first ‘swear’. 50 cents will be going into the swear jar for this one.